I call this meal “adult” because I would have never eaten this when I was a kid. I was a super picky eater and refused to eat onions, mushrooms and pasta that wasn’t elbow macaroni. Honestly, even if you told my former 20 year old self who survived off ramen noodles, fries and booze that I would crave a meal like this, I would have laughed in disbelief and chugged some more natty light. This meal is “adult” because like me, my taste-buds have grown up and can appreciate more complex flavors (and better beers). It’s refreshingly light, 100% vegetarian, simple to make during a busy week night and filling. It’s one of those meals that looks like it took a lot of effort and tastes like it took a lot of time but is actually quite simple (which are the best meals for date nights that stay in). This linguine dish is perfect for those who are trying to substitute meat (like for the Meatless Monday movement) because the texture of the mushrooms do a great job tricking the brain that meat is in this veggie dish. The onions and garlic add a dimension of sweetness and aromatic appeal that should not be excluded. And the white wine! The wine adds that adult flavor whereas the lemon juice keeps it tasting refreshing and light. I hope you give this a try because it will not disappoint. In a medium skillet, melt 2 tablespoons earth balance over a medium high heat. Once butter is melted, add the onion, garlic and a pinch of salt. Sauté for 4 minutes (I like the onions to be translucent). Add the mushrooms and allow them to soften and brown. While this is happening bring a large pot of salted water to a boil and add linguine. After the mushrooms are the desired texture, add the other tablespoon butter and stir. Slowly add in the wine and allow to cook for another 2 minutes. Add in more salt and pepper if desired. 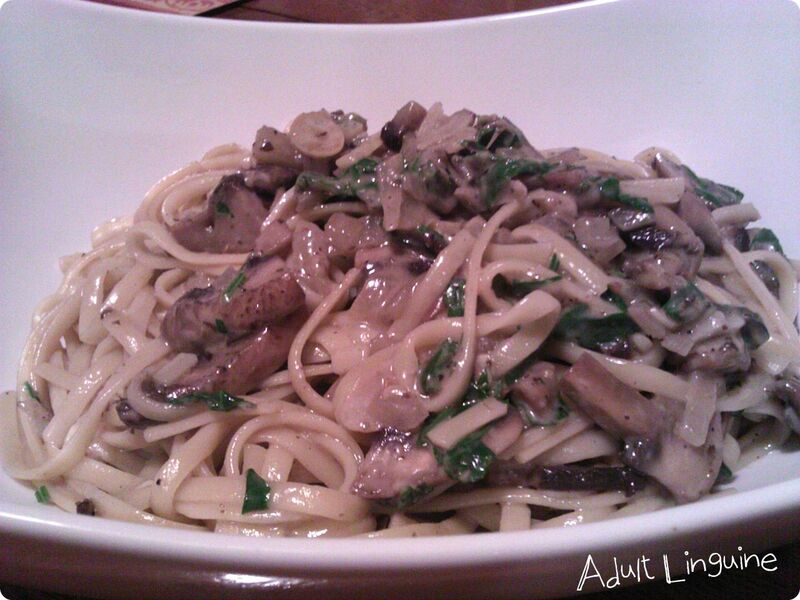 When the linguine is al dente, drain it and add it to the pan with the white wine and mushroom mixture. The sauce will be very thin, that is okay because it will thicken with the addition of the Parmesan. Squeeze in the juice of the lemon and add the Italian seasoning and stir. Turn off the heat. Lastly add in the Parmesan cheese (I add about 1 ounce – 2 ounces, you don’t need a lot because everything else is so flavorful) and the flat leaf parsley. Stir again and place in a large serving bowl. Next postMeal Planning:Why You Should Do It and Tips on How!